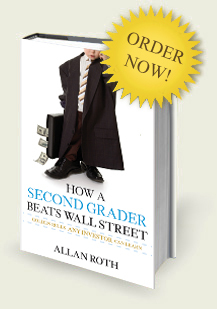 If you’re thinking this is a story about a stock-picking child prodigy, think again. This book is actually about something far more impressive; simple golden rules that we’ve all learned by second grade that can result in a sustained performance improvement of 4% annually! Add to that the power of compounding, and we’re on the path to reaching our financial goals 10 to 15 years sooner, and allowing us the opportunity to do whatever gives meaning to our lives. Trying to disprove the most basic of math concepts that we learned in second grade. and betting against it in a game we have less than a one percent chance of winning. Acting foolish with our money in a totally predictably irrational way. Paying the tax-man far more than we need to. Ignoring the low-hanging fruit that are easy pickings and can increase our returns every year, no matter what the market does. Unfortunately, it’s everything we’ve learned about investing after second grade that causes us to engage in this outsmarting ourselves behavior. We appear to be hell bent on making what isn’t complicated very complicated, often to our detriment. This book, however, will help the reader to “unlearn” many of the financial myths we’ve accepted as facts, and this father-son team will also dispel the notion that an insightful investing book can’t be fun to read. It’s about simplifying our financial lives and getting far greater return by using crisp and simple logic. This is especially relevant in today’s turbulent and treacherous times. Having trouble watching the video or seeing the website? ©2008-2009 Allan Roth, All Rights Reserved.